I had the opportunity to live in Hawaii on the island of Oahu for five months with my husband and three sons. During that time we got to live as locals as well as tourists. Here are some of the things we did while there. I am sure you will find something you will enjoy. Please verify hours of operation of the various locations listed below. If you enjoy botanical gardens, be sure to check out 5 Unique Botanical Gardens of Oahu. At the Aloha Tower Marketplace you can shop, eat, catch a hula show and watch the cruise ships set sail or come into port. 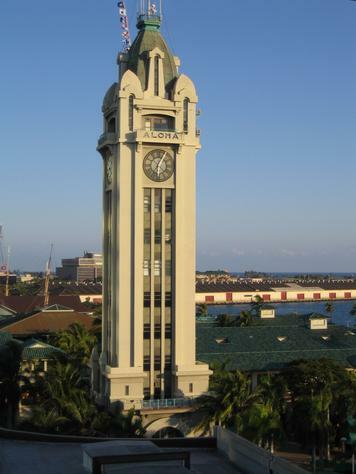 Completed in 1926 and listed on the Hawaii and National Registers of Historic Places, The Aloha Tower still functions as a traffic control center for Honolulu Harbor. In the early 90's the building surrounding the base of the tower was renovated to become a marketplace. You can ride a vintage elevator to the 10th floor of the tower for views of the harbor, downtown, Diamond Head and the Koolau Mountains. The observation deck is open daily from 9:30 am to 5:00 pm. 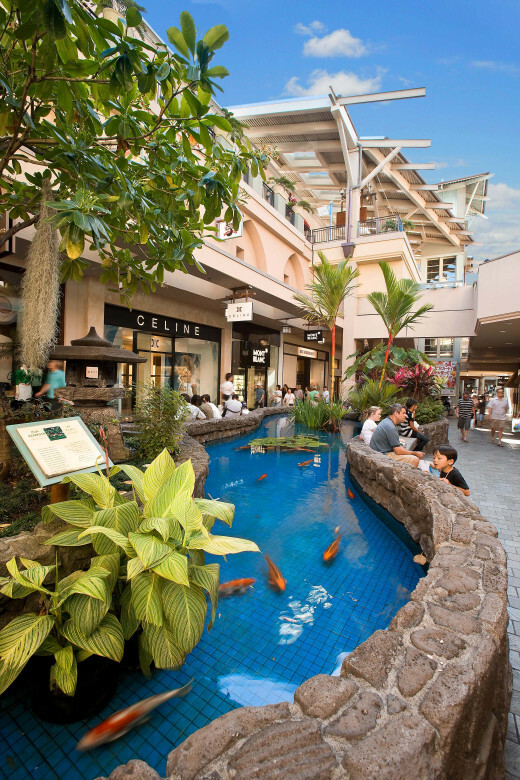 Located just minutes from Waikiki, this is THE mall of Honolulu! With close to 300 shops, an extensive food court, koi ponds and entertainment, this four-level open air mall is a must-see! Hours: 9:30 am to 9:00 pm Monday through Saturday; 10:00 am to 7:00 pm Sunday. Makai Market Food Court opens at 9:00 daily. Check out Banzai Pipeline - home of several top international surfing competitions. This is not a place for average surfers, with waves reaching 50 feet in height during the winter season. Also don't forget to get a shave ice at Matsumoto's in Haleiwa Town. For avid hikers, go to "the end of the road" at Ka'ena Point. At the northwest tip of the island, Ka'ena can only be reached by foot by trekking several miles after Farrington Road ends on either side of the point. 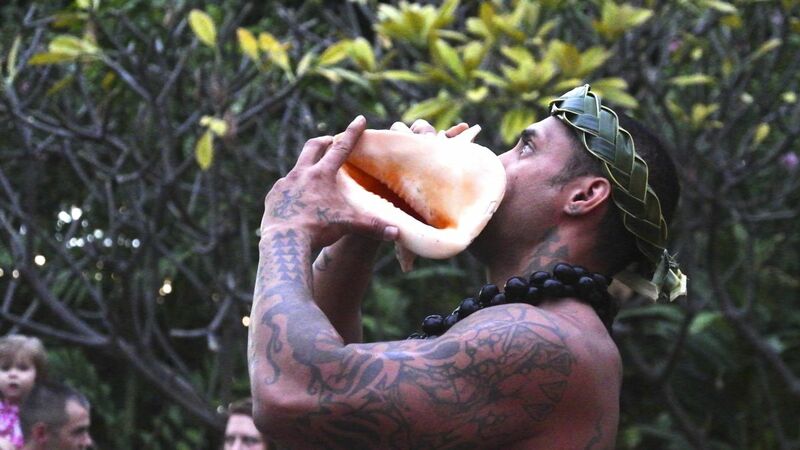 Experience different villages representing the Polynesian cultures of Fiji, Hawaii, Samoa, Tonga and others. 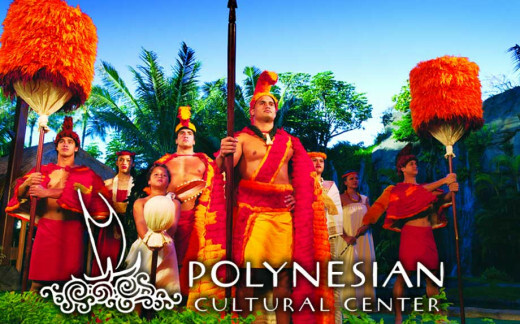 Complete your visit to The Polynesian Cultural Center with a luau dinner and show. With parking lot and gift shops opening just before noon, presentations take place throughout the afternoon until 5:00 or 5:30 pm. See website for luau and evening show times. Closed on Sundays, Thanksgiving, Christmas. No, this is not creepy. This is one of the most beautiful places I have been. 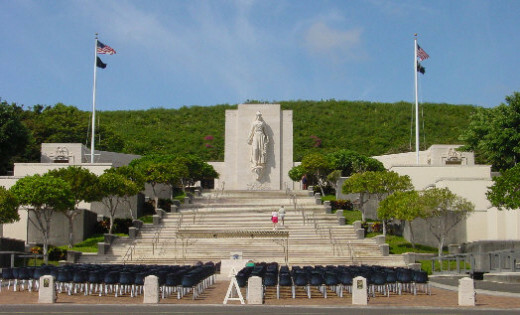 Formally the National Memorial Cemetery of the Pacific, it is the burial sight of nearly 34,000 veterans of World War I, World War II, the Korean War and the Vietnam War. 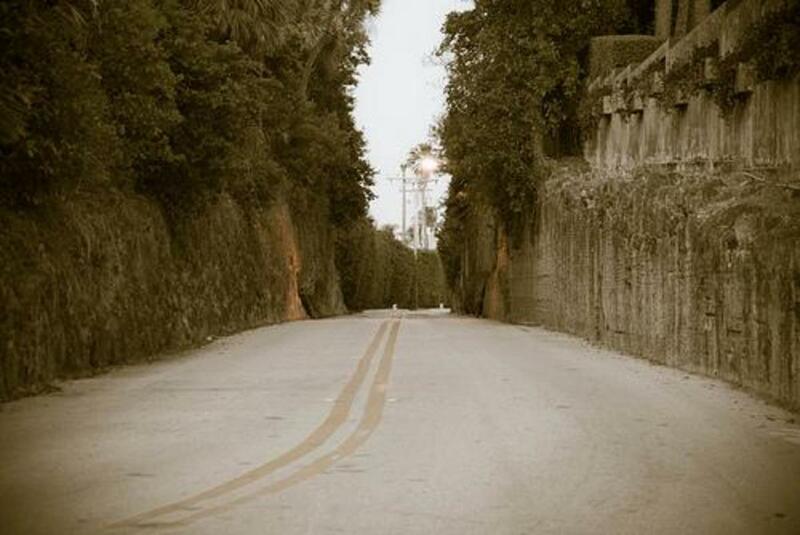 The cemetery is located in a crater that looks like a punchbowl, thus the name. The grounds are immaculate and serene. An easy stroll up the Memorial Walkway leads to an elevated area that gives way to spectacular views of the city, the ocean, and Diamond Head in the distance. Open daily from 8:00 am to 5:30 or 6:30 pm depending on the time of year; open from 7:00 am to 7:00 pm on Memorial Day. The Kahala Mandarin is a lovely hotel and fortunately you do not have to be staying there to enjoy the surroundings. Eat outside at the Plumeria Beach Cafe, just steps from the ocean, then watch the dolphins splash in their own pool or sign up to swim with them through Dolphin Quest available at the hotel. During the Christmas season the hotel boasts a beautifully decorated tree in the lobby, great for taking family pictures! Departing from Hilton Hawaiian Village in Waikiki, Atlantis Submarine Tours offers submarine rides from 9:00 am to 3:00 pm daily. Discover a different kind of "Blue Hawaii" as your submarine descends 100 feet and everything literally turns blue! You can rent snorkle gear or bring your own. If you want to get in a day or just a couple of hours of snorkeling, this is the place to go! Beauty beyond words, both on shore and in the water. After watching a brief video about the fragile ecosystem of a coral reef, you can walk down to the bay or catch the shuttle. You will definitely see colorful fish, and you may even get lucky enough to swim with a sea turtle like we did! But please respect the bay and follow all the rules so others can continue to enjoy everything it offers. 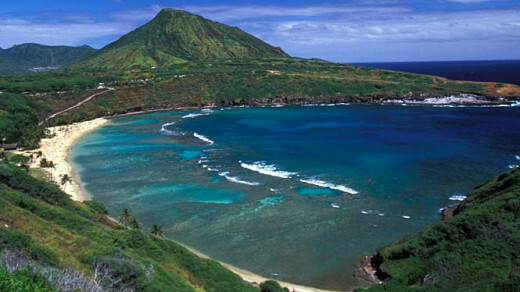 Hanauma Bay is open every day from 6:00 am to 6:00 pm; closed on Tuesdays. *One special note: Do not leave food unattended because mongooses WILL come and eat it while you are swimming! They have taken up residency on the grounds of the park. 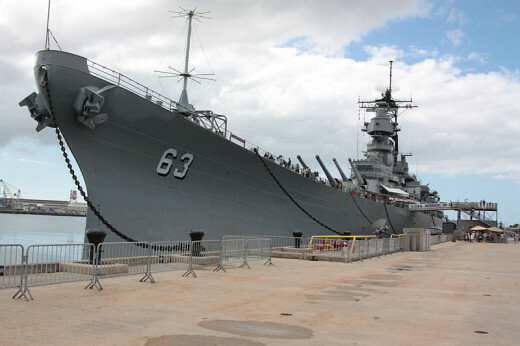 Established as a US Naval Base in 1899 and later attacked on December 7, 1941, by the Imperial Japanese Navy, Pearl Harbor remains a base for the US Pacific Fleet. The attack lead to the direct involvement of the US in World War II. 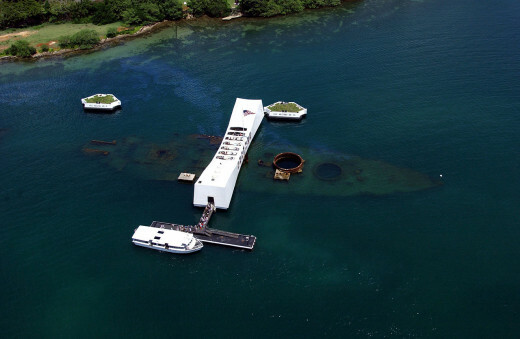 Also located there is the USS Arizona Memorial and the USS Missouri Museum. You can tour the Missouri as well as view the remains of the Arizona sunken below the water of the harbor. The Pearl Harbor Visitor Center is open from 7:00 am to 5:00 pm. Closed Thanksgiving Day, Christmas Day, New Years Day. Open Wednesday, Saturday and Sunday from 8:00 am to 3:00 pm, this is a giant open-air market. 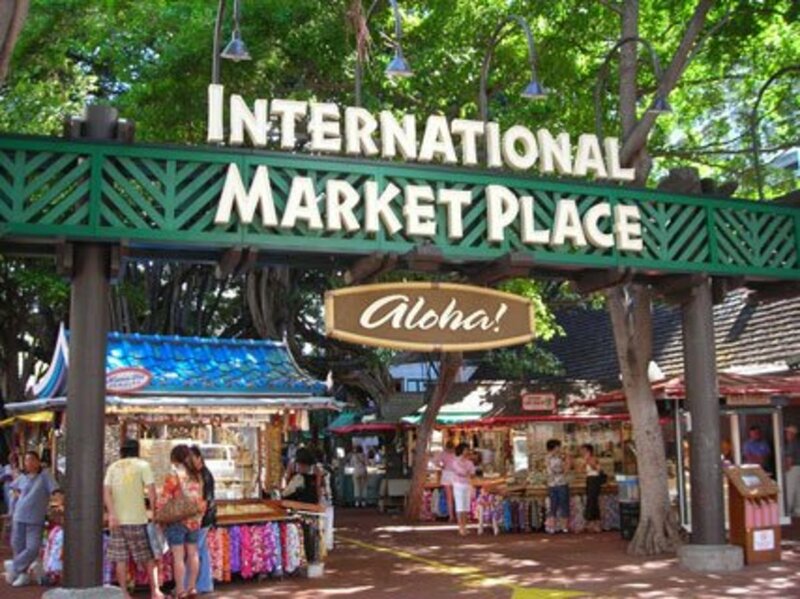 Only 20 minutes from Waikiki, you can find souvenirs, luggage, food, clothes and much more! On Sundays the Swap Meet portion opens earlier at 6:30 am. 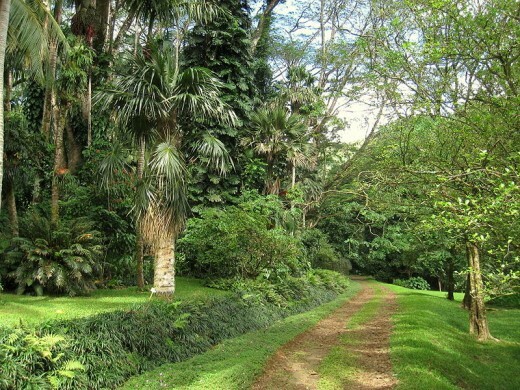 This is a 200-acre preserve located at the upper end of Manoa Valley. With average rainfall of 165" per year, this area of Hawaii is technically a rainforest. Bring insect repellent and good walking shoes if you want to hike the trail--the path can be slippery. The hike through the Hawaiian Restoration section of the botanical gardens culminates at a waterfall. Hours of operation: Monday - Friday 8:00 am to 4:00 pm, Saturdays 9:00 am to 3:00 pm; Closed Sundays and federal holidays. 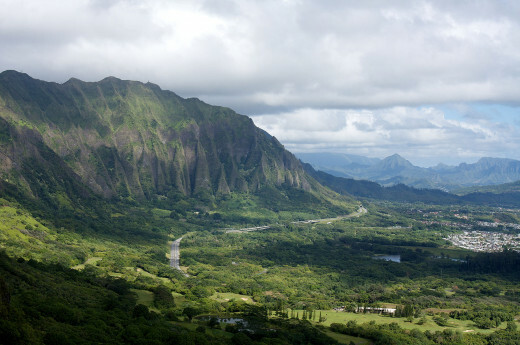 From Downtown, follow the lush Pali Highway (Highway 61) eastward to the lookout for stunning views of the Koolau Mountain Range ahead, the city of Kaneohe below, and the Pacific Ocean stretching off into the distance. This has to be one of the most breathtaking places on earth. Learn about the history of the cliffs (Pali) and the story of one of the bloodiest battles in Hawaiian history when King Kamehameha drove warriors over the cliffs. 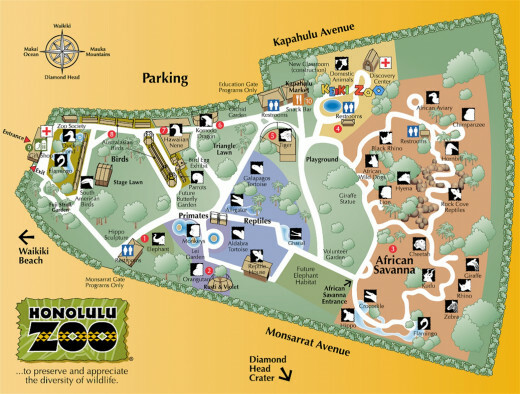 Who knew there was a zoo near Waikiki? From the map shown below you can see that the animal kingdom is well-represented here. And the sight of giraffes walking around with the tall buildings of Waikiki in the background is something to see! Open daily from 9:00 am to 4:30 pm. Closed Christmas Day. The views from Tantalus are second to none! Especially at night. 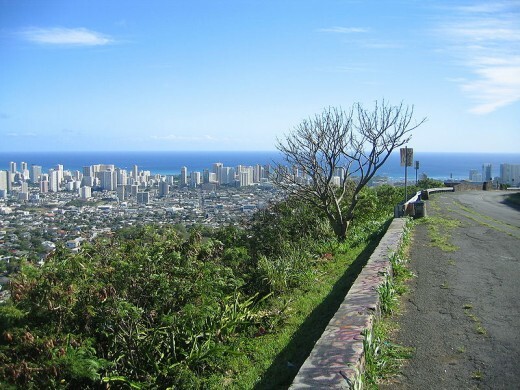 Wind your way up Roundtop Road and Tantalus Road through the Honolulu Forest Reserve and spend some time relaxing at the top as you overlook the hustle and bustle below. What a wonderful gem of an aquarium! 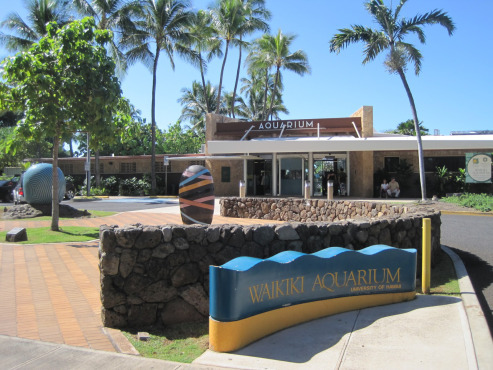 Located at the east end of Waikiki, delight to the sights of seahorses, sea turtles, coral species and monk seals. It has been open since 1904 and is the second oldest aquarium in the United States! Hours: 9:00 am to 5:00 pm daily. Check website for special holiday hours. 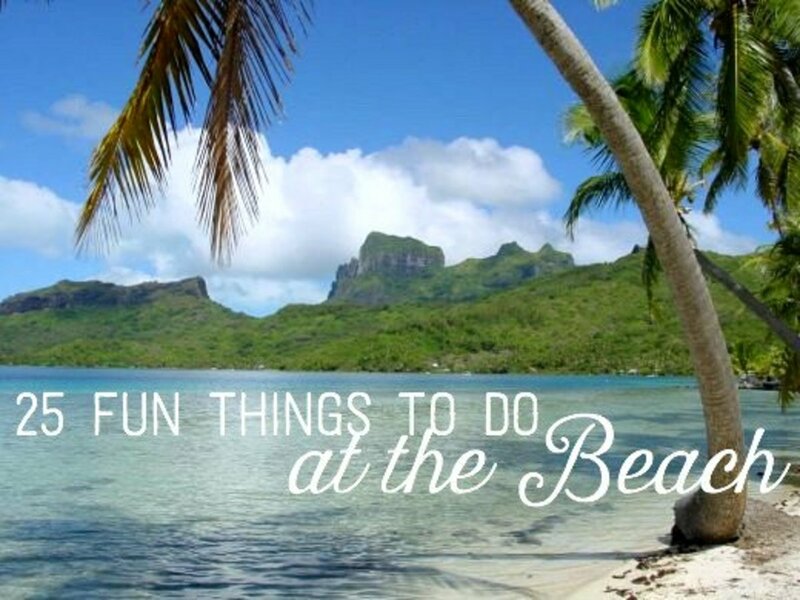 What is your favorite thing to do while on Oahu? Thank you so much @Hawaiian Scribe! I truly love Hawaii--the people, the ocean, the mountains, the food, the culture. I've visited 5 times and I'm having withdrawal! We loved it. It was hard to come back after 5 months there. A lot of the things do stay the same, which can be nice. Thanks for stopping by. Brings back great memories. Spent our honeymoon in Hawaii 21 years ago. Managed to see many of the sites on your list. Need to go back soon. Thanks for sharing.